Home (All Topics) → Health & Fitness → Anatomy & Physiology → Sense of Hearing: Just How Do We Hear Sounds? While most of us taking hearing for granted it is quite a complex process where sound is detected and transformed into nerve impulses that travel to the brain, where they are processed and acted upon. The primary purpose of sound is for communication. However, it is also needed to avoid danger. For example, hearing an approaching car will warn us to move out of the way. Humans can normally detect sound frequencies 20 Hz and 20 kHz. We can also pick up on slight differences in frequency and intensity (loudness). As sound travels through the air it is captured by the outer ear. The earlobe helps to direct this sound to the outer ear. This sound now causes the middle ear to vibrate. These vibrations are then converted to electrical impulses in the inner ear. 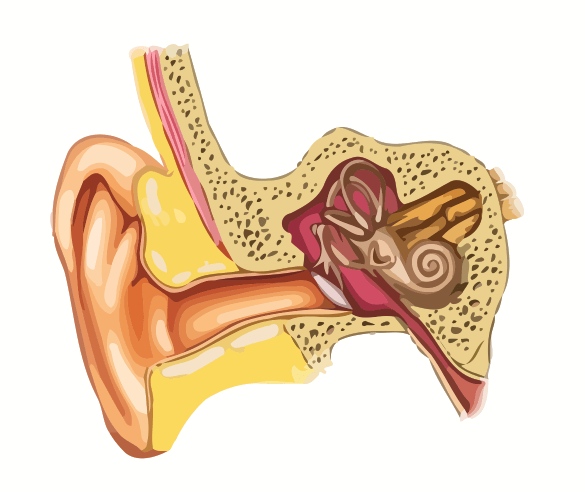 Inside the inner ear is a snail-like-shaped structure called the cochlea. Inside the cochlea are tiny hair cells that transmit the electrical signals along the auditory nerve to the brain. The brain then translates these signals into information we can use. Listening to a constant sound at the same intensity/frequency for extended periods of time. Noise at close proximity (e.g. head sets) for long periods of time. Diseases such as measles, mumps, meningitis, autoimmune. Tinnitus is ringing, whistling, or buzzing noises. These noises are produced by the ear that can be quite severe with some individuals. Tinnitus is usually caused by noise-induced hearing loss, e.g. loud noises. However, it can also be caused by a head injury, and sometimes by medications. In some cases this can be treated by surgery or by medicine. Meniere's disease is also called vertigo. This is severe dizziness. The person has a feeling that everything around them is spinning. They can end up feeling nausea and may vomit. And usually need several hours of total rest in the dark with minimal movement. Aural fullness is exactly what it says. It is a feeling of fullness in the ear. It is similar to the feeling we get when changing altitude, except it does not go away by swallowing or by change in altitude. Otitis media is when repeated illnesses, such as colds and allergies, cause fluid to accumulate in the middle ear and therefore causing permanent hearing loss.